Portland Taiko is 15 years old, which in people time would mean it’s itching to get a driver’s license but in Arts Group Years means it’s long out of those troublesome teen years and well into its energetic adulthood. Still growing, still learning, but with the assurance that comes with the self-confidence that comes with mastery of key skills. Plus, that drumming’s really fun. 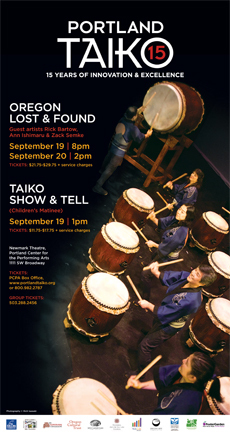 On Saturday and Sunday Portland Taiko‘s big fall concert, Oregon Lost & Found, will shake the rafters at the Newmark Theatre in downtown Portland (or would, if the Newmark had rafters instead of that cool dome thing on top). Artistic director Michelle Fujii and the full taiko orchestra will be joined onstage by guest performers Ann Ishimaru and Zack Semke, who founded the company, and that should make for a celebratory reunion. 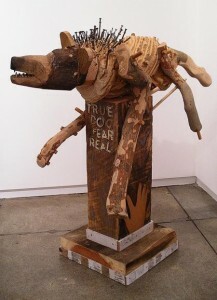 Add the superb visual artist Rick Bartow to the mix and things could really start to fly. 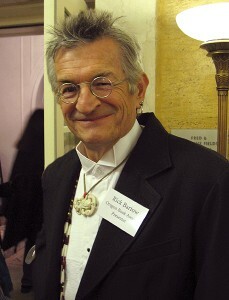 Bartow, whose work so often incorporates the image of Coyote, the trickster of Native American lore, will be onstage painting while the drummers play. I’ve watched Rick work in his studio on the Oregon coast — he likes to crank up the boom box while he’s creating — and it’s a fascinating experience. I have high hopes for this show. 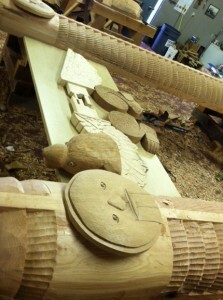 Performances are at 8 p.m. Saturday and 2 p.m. Sunday, with a shorter kids’ show, Taiko Show & Tell, at 1 p.m. Saturday. Tickets online here or at 800-982-2787. As a PT board member I’ll even be on hand Saturday night and at the Sunday kids’ matinee to give a curtain speech. I promise to keep it short — on with the show! — and to remind you nicely to turn off your cell phones and for god’s sake stop that infernal Twittering. And maybe you’ll get a chance to pick up a copy of the group’s new CD, Rhythms of Change. I wrote about sitting in on one of the recording sessions way back in April. Sticking with a Japanese American theme, I’m intrigued by this notice from Reed College about an upcoming talk byÂ Linda Gordon called Impounded: Dorothea Lange’s Censored Images of Japanese American Internment. It’ll be at 7 p.m. Wednesday, Oct. 7, in the college’s Vollum Lecture Hall, and it’s free. Dorothea Lange was a startlingly good documentary photographer, maybe best-known for her studies of poor rural and small-town people and their lives in the Depression years and later. Apparently her work in Japanese American internment camps was too hot to handle, at least for the government officials who hired her. Her images didn’t show the official-version happy holding tank, and 97 percent of them were never published during those crucial years when they might have made a difference. 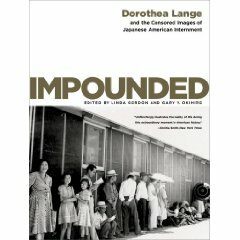 In her 2006 book Impounded: Dorothea Lange and Japanese Americans in World War II, Gordon, a professor of history at New York University, and her co-editor, Gary Y. Okihiro,Â published and discussed 119 impounded photographs Lange took in the internment camps. It can take a long, long time. But the truth has a way of eventually sqeaking through the bars of censorship. Readers of Laura Grimes’ recent post “Scenes from a writers’ marriage: How he got that story” have noted that the link to the original story by Bob Hicks, which ran on Sunday, March 3, 2002 in The Oregonian, didn’t work. That was a link to the Multnomah County Library version; the story isn’t available on The Oregonian’s Web site, Oregon Live. So here it is, unfortunately without Stephanie Yao’s wonderful photographs that ran with the original. A winter rain is snapping against the roof and windows of the Oregon artist’s main studio in South Beach, across the Yaquina Bay bridge from downtown Newport. The little building groans in the wind, which bellows and shrieks and cradles the place, rocking it in a rhythm that is fierce and exhilarating and lulling and somehow timeless. Inside is a cocoon. Moving quickly and efficiently, Bartow tapes three large sheets of paper side by side by side on the wall. “I’ve tried working on a single sheet,” he says, “and it’s really difficult for me. I have scattered energy, sort of like when I’m talking. I jump all over the place.” He puts a few rough pencil marks on each sheet. Lines, dots, straight, curved. Taking a stick of charcoal in his hand, he flattens his palm and smears a streak of gray against the first sheet. “Just to make damn sure I’m not pussyfooting around,” he says. “I have to do something decisive.” Then he slaps handprints on the other two sheets and smears them around. He’s just eliminated the Big Empty.